This data set provides the mean diurnal cycle of precipitation, near-surface thermodynamics, and surface fluxes generated from short-term forecasts from the European Centre for Medium-Range Weather Forecasts (ECMWF) model. The model outputs were 12- to 36-hour short-range forecasts, run at a triangular truncation of T319 and a vertical resolution of 60 levels, from each daily 1200 (UTC) analysis. The version of the forecast model used to prepare this data product was the operational ECMWF model in fall 2000, which included the tiled land-surface scheme (TESSEL) (Van den Hurk et al., 2000) and recent revisions to the convection, radiation, and cloud schemes described by Gregory et al., (2000). The ECMWF model was run for two Large-Scale Biosphere-Atmosphere Experiment in Amazonia (LBA) campaigns conducted in Rondonia, Brazil, during January and February of 1999: the Wet Season Atmospheric Mesoscale Campaign (WETAMC) and the Tropical Rainfall Measuring Mission (TRMM). See Silva Dias et al.,(2002) for additional information regarding the WETAMAC and TRMM campaigns. There are two comma-delimited data files with this data set: the ECMWF model output data and a file containing the mean hourly precipitation observations used to check the model output for biases. Figure 1. WETAMC/LBA and TRMM/LBA sites (Silva Dias et al., 2002). Scale is elevation in meters AMSL. This data set was archived in January of 2013. Users who download the data between January 2013 and December 2017 must comply with the LBA Data and Publication Policy. The model outputs were 12- to 36-hour short-range forecasts, run at a triangular truncation of T319 and a vertical resolution of 60 levels, from each daily 1200 (UTC) analysis. The version of the forecast model used to prepare this data product was the operational ECMWF model in fall 2000, which includes the tiled land-surface scheme (TESSEL) (Van den Hurk et al., 2000) and recent revisions to the convection, radiation, and cloud schemes described by Gregory et al., (2000). The ECMWF model was run for two Large-Scale Biosphere-Atmosphere Experiment in Amazonia (LBA) campaigns conducted in Rondonia, Brazil, during January and February of 1999: the Wet Season Atmospheric Mesoscale Campaign (WETAMC) and the Tropical Rainfall Measuring Mission (TRMM). See Sillva Dias et al.,(2002) for additional information regarding the WETAMC and TRMM campaigns. File #1: ECMWF_SFC_TESSEL.csv-- ECMWF model output data, run at T319 L60 with land-surface scheme TESSEL: (ECMWF TM #295: Van den Hurk et al., 2000). This was the operational model in fall, 2000. Location: Model grid point in Rondonia: at 10.85 deg S, 61.87 deg W (the grid point closest to Rondonia Abracos pasture site). Data source: Extracted from 12-36 short term forecasts from ECMWF model. File #2: Mean_Precip_ECMWF.csv-- the mean hourly precipitation data used to check the model output for biases. 9 Network Network identification: networks (e.g. 1,2,3, or 4) were designated by Dr Betts. See Figure 2. The data set covers the period 1999/01/01 to 1999/03/31. We conducted an exploration of the impact of changing different components in the ECMWF convection schemes, their mass and energy budget closures, and the sequence in which the schemes are called by the model, as a first step toward developing a more robust representation of tropical convection over land (Betts and Jakob, 2002a). The model did not simulate well the morning growth of the non-precipitating convective boundary layer (CBL). 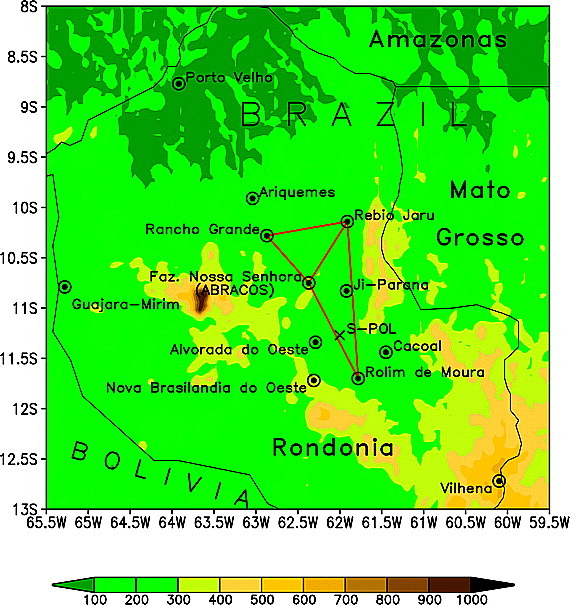 The mean daily precipitation during the wet season compared well with observed rainfall, but there were errors in the diurnal cycle of precipitation over Rondonia. On most days, maximum early afternoon temperature and cloud base height were lower in the model than observed. Maximum equivalent potential temperature was close to that observed. The model surface evaporative fraction was higher than observed and rose to near unity in the late afternoon. The ECMWF model was run for two LBA campaigns conducted in Rondonia, Brazil during January and February of 1999: WETAMC and TRMM. The study site was the Abracos pasture site (located near Ouro Preto d’Oeste, Rondonia, Brazil (10.75 S, 62.37 W; about 30 km northwest of Ji-Parana)). The pasture site was part of a large deforested area (250 km2) dominated by a short grass (Brachiaria brizantha) with isolated palm and hardwood trees scattered throughout the landscape. Note: The data used as input to the model are not included with this data set. The model used as inputs, hourly averaged data from WETAMC and precipitation estimates from four rain gauge networks from TRMM. A micromet tower, eddy correlation instrumentation, and a gas analyzer reported the surface meteorology and energy balance components. A tethered balloon system and a rawinsonde reported profiles up through the CBL and atmosphere, while the structure of the convection nearby was mapped by two Doppler radars (Rutledge et al., 2000; Rickenbach et al., 2002; Cifelli et al., 2002). The estimates of precipitation came from averaging the four rain gauge networks, which were established to help calibrate the TRMM radars (Rickenbach et al., 2002). These four networks were in a northwest to southeast line with the nearest group 25 km east of the pasture site. The mean hourly precipitation data were used to check the model output for biases. Figure 2. Rain gauge networks are indicated by red numbers 1, 2, 3, and 4. Deforestation in the background is light green. Dark green is forest. Center of the range circles (at every 20 km) is at the S-Pol position in Fazenda Jamaica. Yellow circles are the Dual Doppler regions. TOGA radar position is indicated by T. S-Pol position is indicated by S. (Silva Dias et al., 2002). The model outputs used for comparison were 12- to 36-hour short-range forecasts, run at a triangular truncation of T319 and a vertical resolution of 60 levels, from each daily 1200 (UTC) analysis. The forecast model was the operational ECMWF model in fall 2000, which included the TESSEL (Van den Hurk et al., 2000) and recent revisions to the convection, radiation, and cloud schemes described by Gregory et al., (2000). Model data were extracted every time step at the model grid point in Rondonia (10.85 S, 61.87 W) closest to the field measurement site (10.75 S, 62.37 W). Betts, A.K. and C. Jakob. 2002. Evaluation of the diurnal cycle of precipitation, surface thermodynamics, and surface fluxes in the ECMWF model using LBA data. Journal of Geophysical Research-Atmospheres 107(D20) doi:10.1029/2001JD000427. Betts, A.K. and J.H. Ball, The FIFE surface diurnal cycle climate. J. Geophys. Res. 100, 25679-25693, 1995. Betts, A.K., P. Viterbo and E. Wood, Surface Energy and water balance for the Arkansas-Red river basin from the ECMWF reanalysis. J. Climate, 11, 2881-2897,1998. Betts, A.K., J.H. Ball and P. Viterbo, Basin-scale Surface Water and Energy Budgets for the Mississippi from the ECMWF Reanalysis. J. Geophys. Res., 104, 19293-19306, 1999. Betts, A.K., J. Fuentes, M. Garstang, and J. H. Ball M., Surface diurnal cycle and Boundary Layer structure over Rondonia during the rainy season. J. Geophys. Res., 107, No D20, 8065, DOI:doi:10.1029/2001JD000427, 2002. 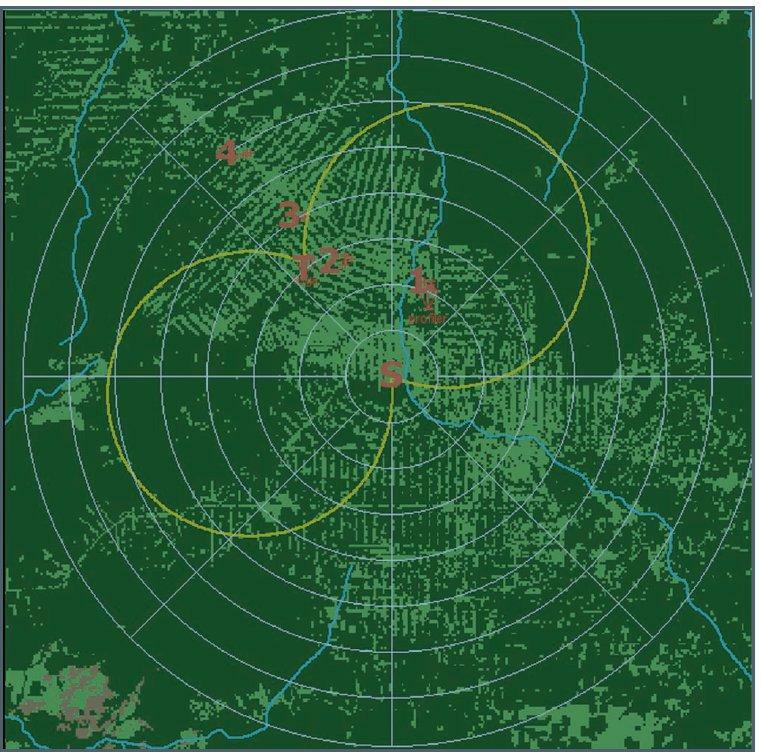 Cifelli, R., W. A. Petersen, L. D. Carey, S. A. Rutledge, and M. A. F. da Silva Dias (2002), Radar observations of the kinematic, microphysical, and precipitation characteristics of two MCSs in TRMM LBA, J. Geophys. Res., 107(D20), 8077, doi:10.1029/2000JD000264. Garstang, M. and D.R. Fitzjarrald, 1999: Observations of surface to atmosphere interactions in the tropics. Oxford University Press, New York, 405 pp. Gibson, J.K., P. Kallberg, S. Uppala, A. Hernandez, A. Nomura, E. Serrano, ERA description. ECWMF Re-Analysis Project Report Series, 1, 72pp., ECMWF, Reading RG2 9AX, UK., 1997. Gregory, D., J.-J. Morcrette, C. Jakob, A.C.M. Beljaars, and T. Stockdale, Revision of the convection, radiation and cloud schemes in the ECMWF model. Quart. J. Meteor. Soc., 126, 1685-1710, 2000. Kim, J., and S.B. Verma, Components of surface energy balance in a temperate grassland ecosystem, Boundary Layer Meteorol., 51, 401-417, 1990. Negri et al., J. Geophys. Res., LBA special issue, 2002. Rickenbach, T. M., R. N. Ferreira, J. Halverson, and M. A. F. Silva Dia, Mesoscale properties of convection in western Amazonia in the context of large-scale wind regimes, J. Geophys. Res., 107, 10.1029/ 2000JD000263, in press, 2002. Rutledge, S. A., W. A. Petersen, R. C. Cifelli, and L. D. Carey, Early results from TRMM-LBA: Kinematic and microphysical characteristics of convection in distinct meteorological regimes, in Proceedings of the 24th Conference on Hurricanes and Tropical Meteorology, 137– 138, Am. Meteorol. Soc., Boston, Mass., 2000. W.A. Petersen, R.C. Cifelli, L.D. Carey, 2000: Early results from TRMM-LBA: Kinematic and microphysical characteristics of convection in distinct meteorological regimes. AMS 24th 11 Conf. On Hurricanes and Tropical Meteorology. 29 May-2 June, 2000, Ft. Lauderdale, FL. 2pp. Silva Dias, M. A. F., et al., Cloud and rain processes in a biosphere-atmosphere interaction context in the Amazon Region, J. Geophys. Res., 107(D20), 8072, doi:10.1029/2001JD000335, 2002. Silva Dias, M.A., A..J. Dolman, S. Rutledge, E. Zipser, P. Silva Dias, G. Fisch, C. Nobre, P. Kabat, B. Ferrier, A. Betts, J. Halverson, M. Garstang, J. Fuentes, A. Manzi, H. Rocha, J.A. Marengo, C. Morales and N.J. Bink, Convective systems and surface processes in Amazonia during the WETAMC/LBA. BAHC News, 7, 3-7, 2000. Memo, # 295. Available from ECMWF, Shinfield Park, Reading RG2 9AX, UK. 43pp. Viterbo, P. and A.C.M. Beljaars, 1995. An improved land-surface parameterization in the ECMWF model and its validation. J. Clim., 8, 2716-2748. Wright, I.R., J.H.C. Gash, H.R. da Rocha and J.M. Roberts, Modelling surface conductance for Amazonian forest and pasture. Chapter 26 in Amazonian Deforestation and Climate. Eds., J.H.C. Gash, C.A. Nobre, J.M. Roberts and R.L. Victoria, John Wiley, Chichester, England, 437-458, 1996.